From Alaska, we were able to get our hands on 3 different brews, all from Anchorage Brewing Company, and each of these brews were unique in their own way. 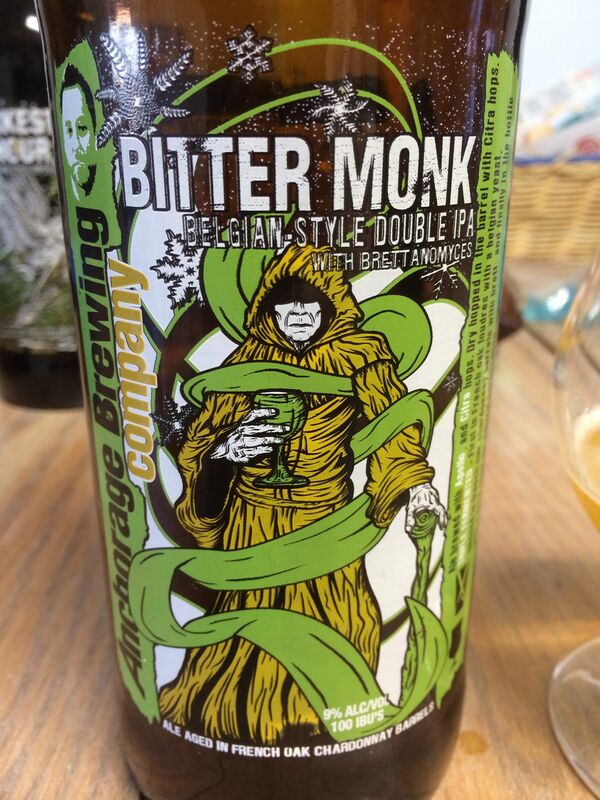 The first beer we had from Alaska was called a Belgian IPA called Bitter Monk. This was the first IPA we had that was brewed with Brettanomyces, and it was amazing. This beer started with a huge citrus smell, like a glass of grapefruit juice, and it tasted amazing. At first I was worried. Between the Brettanomyces, the Belgian-style IPA and its aging in Chardonnay barrels, there were many places for this beer to go wrong, but it never did. Instead, it was an incredibly unique beer that I will not forget anytime soon. Moving on from the Bitter Monk, we opened another bomber from Anchorage Brewing. 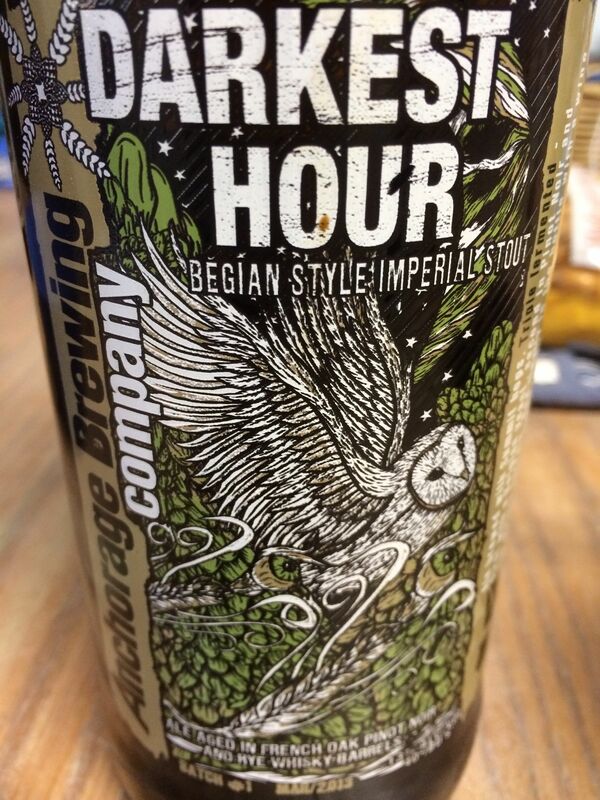 This one an Imperial Stout called Darkest Hour. This is another beer that appears to have had the kitchen sink thrown at it. Triple fermented, aged in two different barrels, first a Pinot Noir barrel, then a Rye whiskey barrel, and finally bottle conditioned with a wine yeast. Again, like the Bitter Monk, this beer had plenty of opportunities to go wrong, and just like the Bitter Monk it never did. From the bottle to the glass, this beer poured like syrup. It was dark in color and smelled of chocolate and coffee, with hints of rye and pinot noir from the barrels. With its strong chocolate and coffee flavors, this beer is clearly a coffee beer. It was very sweet tasting, with a slight grainy mouthfeel reminiscent of Mexican chocolate. The character of this beer was amazing, and the flavors were complex. The only issue we kept coming back to was the smell. There was something strange with the mixture of all that was going on that interfered with everything else, keeping us from truly loving this brew. Still, it was one of the best beers of the year. 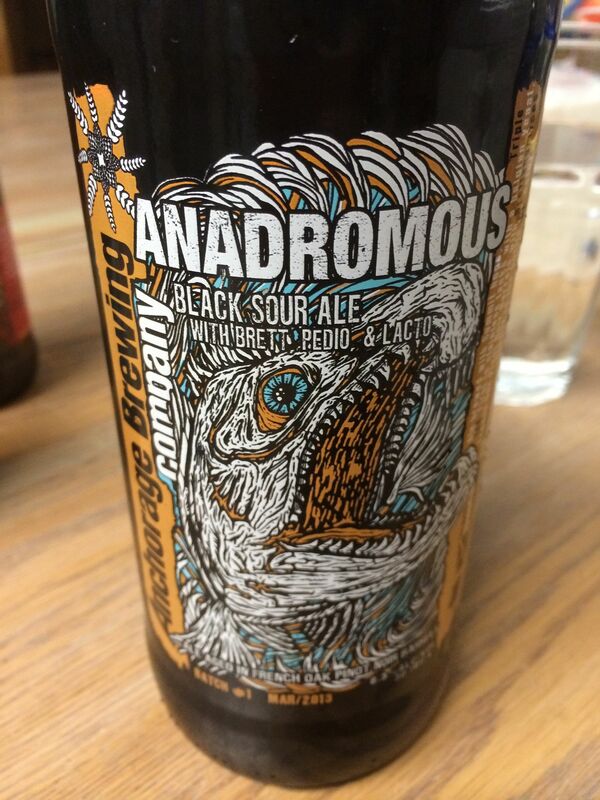 The final beer from Anchorage brewing was a Black Sour Ale called Anadromous. Wow, this was yet another amazing beer from Anchorage. I loved the sour taste, and the complex fruit flavors. This week, we got our hands on three different brews from Anchorage, and they were all special. There is clearly something amazing going on up in Alaska. One more post, and 50 states have been covered. Next up Hawaii.